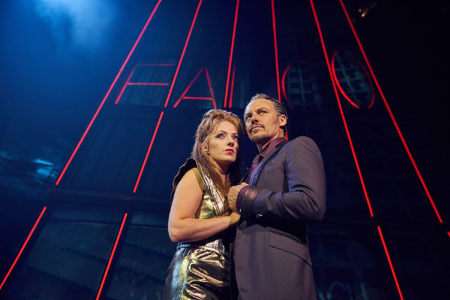 Should you go and see a jukebox musical of an artist with whom you're not that familiar? Do you get the same enjoyment out of it? I found Sunny Afternoon to be a pleasant experience but my parents, ie people who could name more than a handful of Kinks songs, properly loved it. I ask this because I went into Bat out of Hell only being able to name three Meat Loaf songs and one of those is because of Céline Dion. Though quite how songs with titles like ‘Life Is A Lemon And I Want My Money Back’ and ‘In The Land Of The Pig, The Butcher Is King’ passed me by, I'll never know. In all honesty, it doesn't really matter here, for this is the kind of hell-for-leather production that defies reality in every possible way. Does it matter if you don't know the songs? Not a jot. Does it matter if you can't quite work out what the hell is going on? There's a prop newspaper on your seat and a pre-show video spelling it out for you. Why have that group of house servants stripped to luminous yellow underwear for a dance number? Don't ask why. Should you take any of this seriously? Well no, but somewhat at your peril. On the face of it, there's a lot to enjoy in the ridiculousness of it all. Jim Steinman's book sets the story in a dystopian future where dictator Falco rules over Obsidian, formerly known as Manhattan, in his high-rise tower whilst gangs of kids roam underground, forever stuck at 18 because of… reasons. Strat, the leader of the pack, has the hots for Falco's daughter Raven, just about to turn 18 herself, and it is their doomed romance that dominates the action. 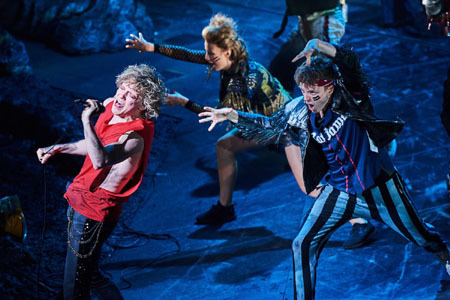 Andrew Polec and Christina Bennington have real fun as the leads, both possessed of strong rock vocals and the hungry physicality of young lovers which comes across well in the musical numbers. There's just not a lot for them to work with in terms of the book, or character, which with a running time of nearly three hours is a bit of an issue. Rob Fowler and Sharon Sexton as Raven's warring parents have much more fun camping it up to high heaven in eye-popping numbers like ‘Paradise By The Dashboard Light’ and finding a rare moment of real pathos in ‘What Part of my Body Hurts the Most?’. This OTT approach is clearly how director Jay Scheib has attacked the whole show whilst never quite managing to answer the question why does 2100 in Obsidian look so much like a Pat Benatar video. Jon Bausor's flashy set fills the large stage well and live video work from Finn Ross provides an interesting if baffling added texture. The orchestra pit of the Coliseum also gets used in a way which must surely be a first in its 113 year existence, even if the execution doesn't quite match up to the audacity of the concept. And then there's Emma Portner's striking use of choreography which is breath-takingly naff. Hilariously so in some cases, as in the title number, but frustratingly so in others, particularly ‘Objects in the Rear View Mirror May Appear Closer Than They Are’ where Dom Hartley-Harris, Giovanni Spanó and Patrick Sullivan's heartfelt vocals are undermined by the insertion of random dancing for dancing’s sake. We also have to acknowledge other elements that are problematic – no matter how many times the male characters’ shirts fly off, that's no excuse for not giving a barely-18-year-old character a bottom half to her costume for large swathes of the show.